Jason Bourne is a new action movie and the fifth film installment in the series based on the same named character created by author Robert Ludlum. Matt Damon finally returns to the title role and reunites with director Paul Greengrass for the first time since 2007s The Bourne Ultimatum. However, this new movie follows 2012s The Bourne Legacy, which starred Jeremy Renner as a totally separate character. Like many people, I thought that Legacy was a bust, so I was excited to see that they were going back to the original formula this time around. In addition, I strongly believe that the original Bourne trilogy is one of the best of the 2000s with Ultimatum in particular being one of the greatest pure action movies ever made. Those who have seen the other films will recall that Jason Bourne (Matt Damon) is a former CIA assassin, who also happens to suffer from extreme memory loss. Now, Bourne has come out of hiding to find out more about his true identity. Early on in the movie, he receives some information about his past from his friend Nicky Parsons (Julia Stiles). It doesn’t take long for the CIA to find out about this, and soon Bourne finds himself being hunted down by his former organization yet again. While this plot sure sounds a whole lot like the original Bourne movies, I think that a return to that template was just what this franchise needed after a failed reboot (Legacy). Speaking of which, having Matt Damon back as the star was very satisfying and he was better than ever in what is undeniably one of his most popular roles as an actor. I would also add that Alicia Vikander and the veteran Tommy Lee Jones turned in nice performances as the CIA agents that were hunting Bourne down. Coupled with that were a handful of mind-blowing action sequences throughout the movie. That being said, I do have some issues with this film, including a rather uninteresting subplot as well as a few moments that were a bit too over top for me. Personally, I prefer the original trilogy to this new installment, mostly due to the more realistic take on the action. 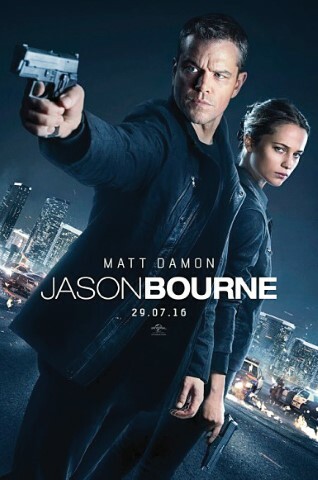 All things considered, there is no doubt that Jason Bourne is a far superior film to its lackluster predecessor, a fun summer action movie and a respectable chapter of this series.